Tattoos are often more than simple body art. Many people get tattoos that have deep symbolic meanings and represent specific experiences in their lives. Regardless of the reason for getting a tattoo, more than 20 percent of people eventually regret the decision to get one and want to have it removed. In some cases, having a tattoo at all may impede professional advancement. In others, tastes or circumstances may have changed, and they want to replace the original with a new design. Whatever the reason, this has, historically, been a difficult, long, and quite painful process. Gone are the days of tough-to-remove tattoos. With the addition of PicoSure tattoo removal, Serenity Rejuvenation Center now has the ability to erase unwanted ink more effectively than ever before with arguably the best results in tattoo removal Seattle has to offer. Additionally, this new technology affords faster recovery time, less pain, and greater results with fewer treatments than any other technology in the history of laser tattoo removal for virtually all patients. 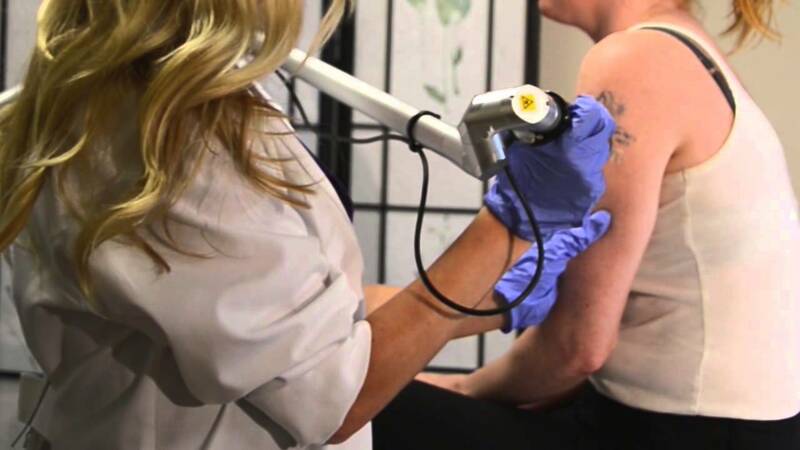 From the early 1990s to 2013, nanosecond laser technology was considered the gold standard for removing tattoos. Enter PicoSure laser technology, the world’s first picosecond laser platform. “Pico” means one-trillionth, and PicoSure is 1000 times faster than nanosecond technology! This difference in speed and pulse width changes the mechanism of action from a photothermal mechanism (heating of ink) into a primarily photomechanical mechanism (pressure and shattering of the ink). This advance has resulted in a process that requires less downtime, reduces the length of treatment sessions by half, and is very effective against even the most stubborn of colors. Compared with nanosecond pulse durations, picosecond lasers are also more acutely targeted to a specific area, so there are fewer adverse effects, such as scarring and/or hypopigmentation. PicoSure uses energy in the form of short bursts—known as PressureWave technology—to target the various pigments of the tattoo and break down the ink particles under the skin’s surface into minuscule dust-like particles. These particles are then absorbed by your body and filtered out in the lymphatic system through the properties of normal metabolism. This process takes around six to eight weeks. The PicoSure laser is it has even been proven to successfully treat dark, resistant blue and green inks, as well as previously-treated, recalcitrant tattoos that were not successfully cleared in the past. A tattoo that no longer is significant to your life can be completely erased for a fresh start. Because the PicoSure technology uses energy rather than heat to break down the pigments, this method of tattoo removal in Bellevue also causes less pain than other methods of tattoo removal. Of course, “less” is relative and different people have different pain thresholds. A topical numbing cream or injectable local anesthetic can be used to make the process more comfortable for the patient. Dr. O’Connell has a great deal of experience and training in pain management and will make the treatment as comfortable as possible. Am I a candidate for PicoSure tattoo removal? While PicoSure has been approved for all skin types and colors, not everyone is a candidate for the procedure. Contraindications include certain illnesses and medical conditions, as well as hypersensitivity to light and the ingestion of specific medications. To find out if you are a candidate, schedule a consultation with Dr. O’Connell. He will thoroughly review your medical history and any current conditions you may have and determine whether you are a candidate. If you are, he will work with you to develop a treatment plan to help you achieve your aesthetic goals, finally free from an unwanted tattoo.